Despite lower than normal signal strength levels, several good readings were reported. Jeff, W3JW had three readings better than 10mHz and his 160 meter reading hit the nail on the head. It seems my 160 meter signal hit a brick wall at the California border, as no West coast stations copied the signal. Thanks as always to John, WA1ABI for providing audio snips of all four transmissions. K2CM WNY FN22ac w6oqi was about S3 here w/QSB in Vestal, NY. Nothing from the west coast on 80M, just a few stations in the south. I think that the dust om my equipment hampered me... Using Flex F1.5K with Wavetek 5120A. W5NZ AL em62vi Used SpecLab for measurements and CHU (7850) as reference freq. CHU on 3330 had far too much doppler shift here to be useable. W3ULS MDC FM18LW 2/2/12. Pretty weak sig here. W9ZB IN EM69xp K5CM signals were good here, W6OQI sigs were weak and in and out of the noise. Still fun, though, & I think I'm close on all. KØMZ KS EM28ix Thank you, Connie and Marvin, for the FMT this evening. I did not hear anything for Connie's 40 meter run here in Kansas. Connie's 160 meter signal was very strong, 30+ over 9 with very little doppler and almost no QSB. Marvin's 40 meter signal was S9 on peaks and usually around S5 with moderate QSB and QRN. Marvon's 80 meter signal was around S7 to less with QSB and lots of QRN. I used a Hallicrafters SX-73 and tuned a transfer oscillator/counter by ear. W6OQI LAX DM04vf The K5CM 40 meter signal was s8 to s9 here in Southern California but the K5CM 160 meter signal must have stopped at the border or skipped to Hawaii as not a trace of the 160 signal was heard. AB4RS VA FM18hw K5CM came in at S9. Could barely make out W6OQI, but SpectrumLab was able to pull it out of the mud. Fun as always. WA6VPL SB CM94sq Still working with the steep learning curve using Spectrum Lab. Good signals from both stations tonight. I hope my calibrations from the last test are still accurate. K7HIL AZ DM42ph Band conditions were pretty bad here with high QRN/QRM as well as weak signals. My setup is an IC7800 with a Thunderbolt 10MHz reference. I accomplish a calibration of the sound card, as well as the receiver hardware, using a HP3325A signal generator. I have Spectrum Labs set up in stereo and measure the Main RX (LSB) and the SUB RX (CW) and do all the math in Excel. I really do not understand how the folks who keep getting good results handle the atmospheric phenomena. N5DM STX EL29fs QRN difficult this evening. Doppler not so bad. Kenwood TS-480S and DigiPan v2.0. Still do'in it the hard way! Thanks to K5CM and W6OQI. K6HGF LAX DM04 No copy on K5CM 160 meter run. N4AU AL EM62vp Kenwood TS570 and Speclab. Calibration to CHU 7850. All signals very good at this location last night. Thanks to both transmitting stations. W3SA NC EM95qb Signals were S9 from K5CM on both frequencies but I corrupted the data file for 160. Signals from W6OQI were about S6-7, 80 meters was just above the noise and fading. KU4PY AL em62wj All signals were very readable here in Alabama. No extraneous interference this time. I averaged 2 external signal sources for calibration and made the measurement using my ICOM746 pro and Spec Lab. The radio had been on for 3 days. Used a vertical for 40 and 80, and a beverage type ant. for 160. VE2IQ ON FN15nt Sigs weak but OK - appreciate the tighter time format. Tnx for another night of fun. WA1ABI RI FN41jp Propagation fair, Doppler huge on 40m and 80m. Thanks to Connie and Marvin for another great FMT. W4UK SC EM93 K5CM 40 M sigs were good here - S9+10, but other 3 so weak could not copy CW. No copy on W6OQI 40M at all. Used Flex 5000a with TBolt GPSDO and FLDIGI. K6BZZ AZ DM33xb Interesting conditions. K5CM good sig on 40, very weak on 160. W6OQI good sig on 80, very weak on 40. Thanks for running the test. Always a lot of fun. N3FG EPA FM29 All signals fair to good except W6OQI on 80M. That was pretty noisey here. I took a shot at it for what it is worth. Hi. Used the IC-7200 and Spectran. Thanks again to both of you for another first class event. K9KK OK EM15 Thanks Connie and Marvin. I guess I need more practice. The demons got me this time. W3JW VA FM17TN Signals were average to below average tonite. Marvin's 80M sig strength was not quite up to it's usual level. Plenty of 80M and 40M doppler to go around for everybody (at least it's consistent in that regard!). Tnx fer FB FMT! VE3OAT ON FN25 A bit of a lash-up with loose wires at the moment but I am trying an HP Z3801A GPS-DO instead of my old WWVB-DO. Feeding the 10 MHz to a TAPR TADD-2 decade divider and then to my old harmonic generator to create 1 kHz markers through the HF spectrum for comparison with the live signals. I almost expected a spurt of molten lead out the bottom, but all was well. Until I see my results of course! Strangely, there seemed to be the least amount of Doppler on W6OQI's 80 m signal. Thanks to all! KD2BD NNJ FN20XD The Kp index was 2. Connie's 160 meter signal was weak, but grew stronger during the key-down period as his received carrier frequency rose slightly as well. Marvin's 80-meter signal flirted with the noise level, and I observed almost a 0.8 Hz deviation during the key-down period. AA8K MI EN82sx Signal levels in dBm, all measured on the same vertical antenna: K5CM 40 meter -81 Noise Floor -110, K5CM 160 meter -92 NF -120, W6OQI 40 meter -88 NF -105, W6OQI 80 meter -103 NF -115, WWV 2.5 MHz -91, WWV 5 MHz -62, WWV 10 MHz -72, WWV 15 MHz -91. I used Open HPSDR, Flex-Radio's PowerSDR, Thunderbolt GPSDO, and Spectrum Lab. I offset the HPSDR frequency about 500 Hz to make a tone with the HPSDR BFO, used PowerSDR to make a wave file. I played the wave file back and ran Spectrum Lab, noting the offset from the HPSDR frequency. I used a TAPR TADD-2 connected to the GPSDO and receiver as a marker generator to check for DDS tuning word and sound card errors. Antenna: ground-mounted vertical 10 meters high. AF9A IN EM69wv Pretty good signals on 40 and 160, Connie. W6OQI was pretty much in the noise on both bands for me. Thanks! K7TT WWA CN87wl Thanks to both for your efforts. No signal heard from K7CM on 160M. Lots of warble on signals. Made best guess. K5CM OK EM25 Noise levels were very high because of a nearby thunder storm. Spectrograph of W6OQI 40 Meter signal. A HP Z3801 GPS frequency source clocks a HP-3336B. A 10 db transistor amp follows and drives a 12BY7 / pair 6146. Then to the final amplifier, a Dentron 2500 running 350 - 500 watts out on 160, and 40 meters. There are no mixers or any device in the chain of amplifiers that might impact the accuracy of the GPS frequency source. As a reality check, I periodically log the frequency source against WWV and other GPS referenced sources. 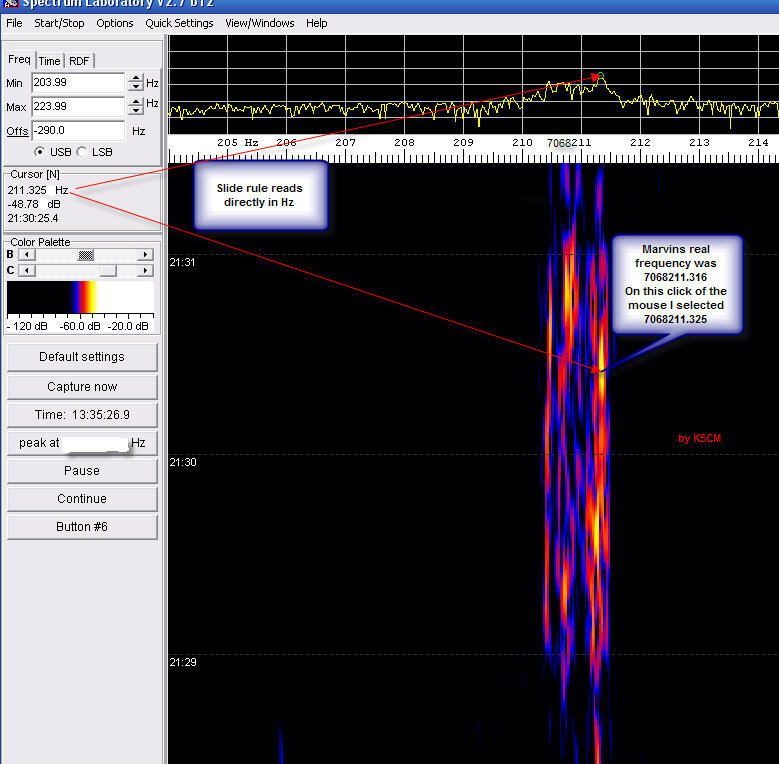 I monitor each transmission with a completely separate receive system to look for any instability or short term drift.